Anna Mayer makes a turn while snowboarding on Spar Gulch on Aspen Mountain Tuesday morning. Snowmass will open Thursday with 20 runs and an estimated 570 acres of terrain, officials announced Tuesday. The Village Express, Sam’s Knob, Big Burn and Elk Camp chairlifts will be open along with the Meadows Lift and Meadows Carpet, Sky Cab and Treehouse Carpet. Terrain will be open on the Big Burn, Elk Camp and off the Village Express. The Big Burn terrain will include the Powerline Glades and Sneaky’s Glades. Tuesday, Copper Bowl area at Aspen Mountain opened, adding another 60 skiable acres. Aspen Skiing Co. officials are optimistic that better snow conditions to start the season and creation of a new ski pass could fuel growth in skier visits at its four ski areas this season. Skico experienced a 7 percent decrease in skier visits last season mostly due to poor snow conditions. This year, so far, natural snow has fallen and cold temperatures have allowed ample snowmaking. 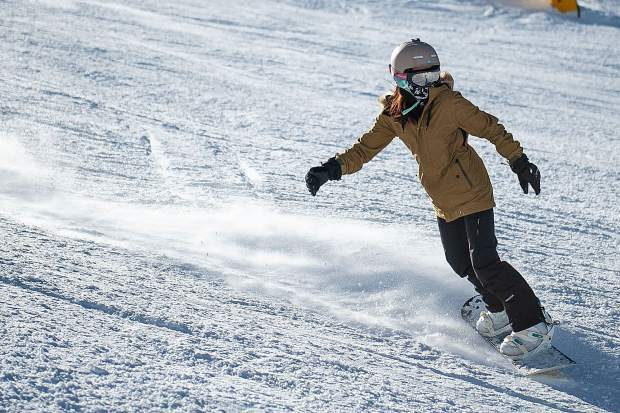 Aspen Mountain opened five days early Saturday — not only giving locals a place to play but also helping create a buzz about stellar early conditions. Skico officials also are bullish because new “hot beds” for tourists will open in Snowmass Village with the debut of Skico’s 99-room Limelight on Dec. 14. Then there’s the unknown factor — the effects of the Ikon ski pass. Skico’s affiliated resort operator, Alterra Mountain Co., created a new pass for this season that includes up to seven days of skiing in the four Skico resorts. At this point, the outlook for the season is either half-full or half-empty, depending on perspective. 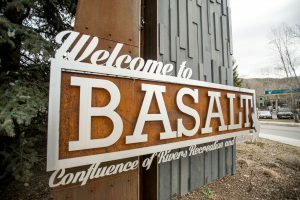 Stay Aspen Snowmass, the central reservations business owned and operated by Skico, reported this week that tourist reservations on the books as of Oct. 31 were up 0.7 percent for the winter compared with the pace at the same time in 2017. Bookings are down in December and January but up in February and March. “To combat these challenges, Aspen Skiing Co., along with support from lodges, created promotions targeting early-season skiers through air credit flash sales, $60 lift tickets, Free Fridays and $39 pass benefits,” Stay Aspen Snowmass announced in a media statement. The promotions appear to be working because the pace picked up in October, the company said. 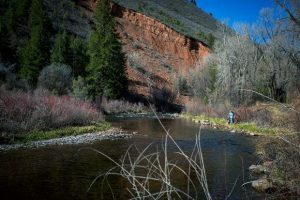 “The next 30 days will be very telling with how December fills, now that opening day is upon us,” Stay Aspen Snowmass said in its statement. Ertl put a positive spin on the outlook. “I think that we have high hopes for every season and are thrilled that we have cold temps and early snow right now,” she said. Skico isn’t the only resort making sure skiers know it has been snowing. National Ski Areas Association, an industry trade group based in Lakewood, hasn’t tracked early resort openings, but says they have been plentiful. The ski industry grapples with something known as the “snow hangover” effect. The theory contends that when there’s average to above-average snowfall one season, it will build momentum for the next season. Skiers will have confidence, warranted or not, that the coming season will be good. The reverse is also alleged to be true — a bad snow year creates problems generating bookings the following season. Poor conditions in parts of the country appeared to have hurt the ski industry as a whole last season. Skier and snowboarder visits — the purchase of a ticket for any part of a day — totaled 53.3 million. That’s down 4.3 percent from the 10-year average. Last season was just the 23rd best out of the past 40 seasons. For the 2017-18 season, 38 percent of ski resorts opened late while only 21 percent opened early, according to data collected for NSAA. Another 41 percent of reporting resorts opened on time. Rocky Mountain resorts fared better in 2017-18 than the industry as a whole. The region’s resorts accounted for 20.8 million skier visits — higher than the 10-year average. However, it was an uphill fight. 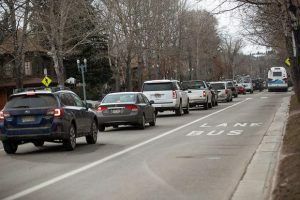 Visits were down 20 percent in December in the Rocky Mountain Region and another 9 percent in January before snow started falling regularly in March. That’s why resorts are trying to build excitement by letting consumers know the slopes are already covered with snow. Some critics contend that the ski industry’s biggest problem is charging prices that create a barrier to entering or staying in the sport. The average single-day lift ticket price was $128 last season, according to an end-of-season survey conducted for NSAA. In the Rocky Mountain Region, which includes many of the destination resorts where traveled take extended vacations, the average daily lift ticket was $149. Discounts are typically given by resorts for multi-day purchases. Nevertheless, that’s why the pass war between Alterra Mountain Co.’s Ikon Pass and Vail Resorts’ Epic Pass looms large. The Ikon was initially sold for $899 for unlimited skiing at 12 resorts and up to seven days at other participating resorts such as Aspen Skiing Co. That can drastically reduce the price from lift ticket prices. An Alterra official said at a conference in Vail this fall that the company expects to sell 250,000 Ikon Passes in the first year, according to an article in the Colorado Sun. Vail sold about 750,000 of its Epic Passes last season, the article said. 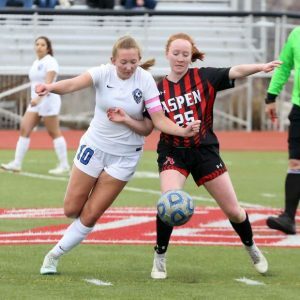 NSAA’s survey showed that paid tickets accounted for 49.1 percent of the national visits last season while season passes accounted for 42.6 percent. Complimentary tickets and off-duty employee use generated the remainder. The market share comprised by season-pass holders could soar now that the two industry heavyweights are battling it out.